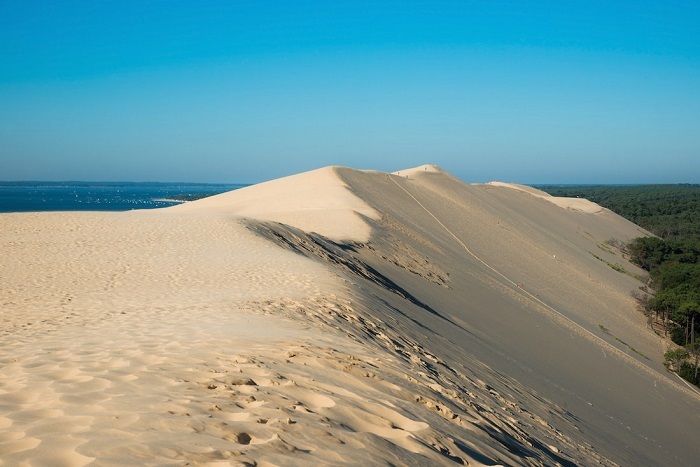 The dune, which is a national listed landscape, is an impressive 2.7km long, 500 metres wide and 110 metres above sea level. 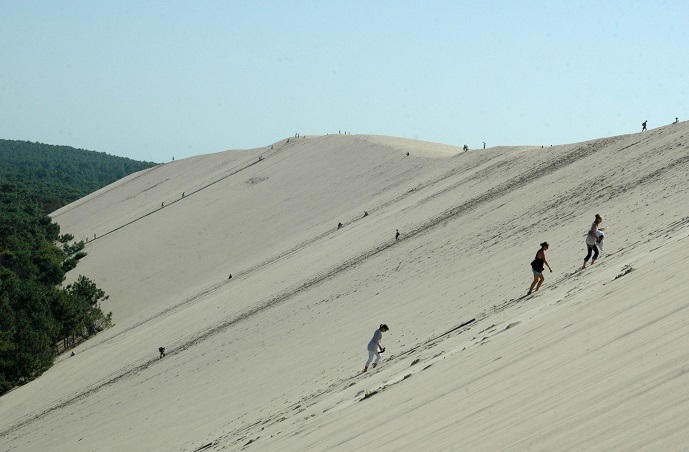 Over one million visitors walk around or scale the sand dune firstly due to the unexpected location and secondly as it looks like something that has been lifted straight from the Sahara desert and dropped in France. 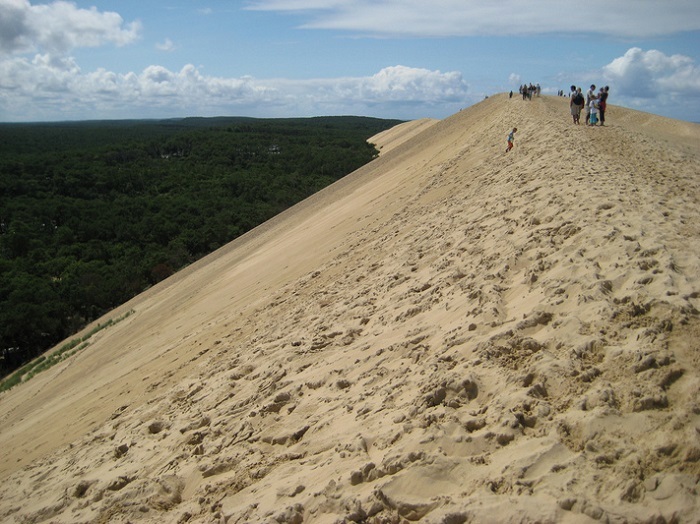 The Dune of Pilat is still growing and moving steadily inland taking over the forest surrounding it. At low tide the surface of the sandbanks begins to dry and the Atlantic wind blows the sand onto the dune. In 1928 a family decided to build house by the side of the dune and it was reported by the local press in 1936 that the house had been completely overtaken by the sands and could no longer be seen. Since records began the dune has covered over twenty houses and two roads and on average moves between four and five metres inland. 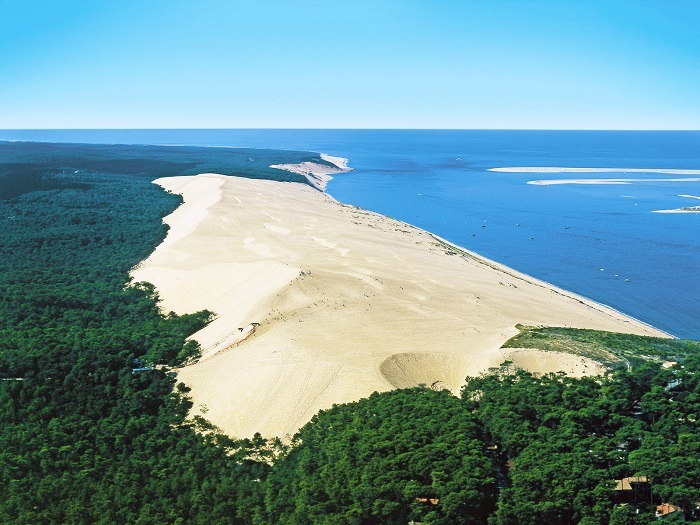 The Dune du Pilat is often referred to as the Dune du Pyla which isn’t the correct name even though it is often used. 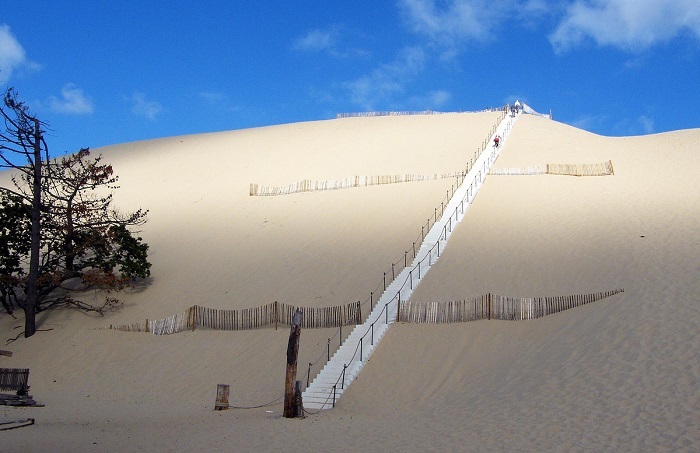 The confusion arises from its location next to the 1920s resort of Plya Sur Mer and on the journey to the dune you will often see signs for both Dune du Pilat and Dune du Pyla but both lead to the same place. It is free to visit anytime day or night (you have to pay for the car parks) and you can choose the easy option of taking the stairs or the difficult option of walking straight up the sand dune. Either way provides a fantastic over the bay when you arrive at the top. It is well worth taking a picnic and spending some time at the top. We are taking bookings for summer 2017…..send an email to info@thomasjamesholidays.co.uk or give us a ring on 01942 602104 if you fancy a holiday on the Ile d’Oleron this summer!